The move by the country’s largest oil-producing province is aimed at easing the crisis in the nation’s energy industry. 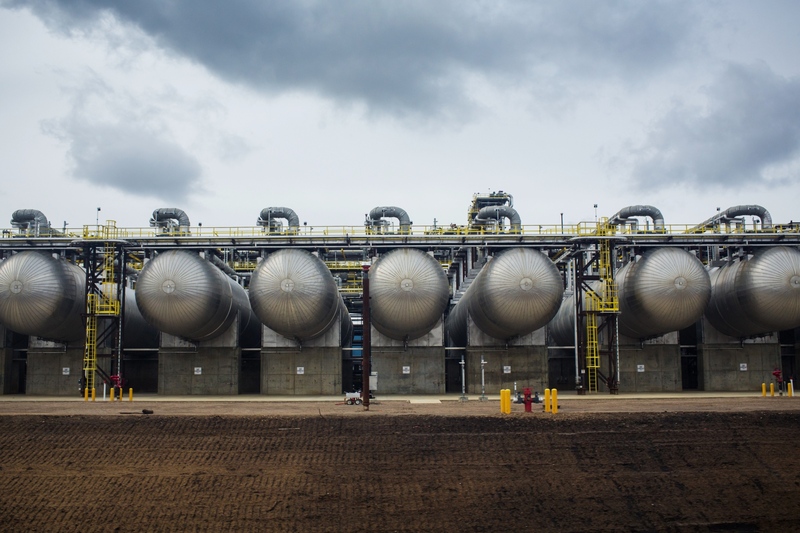 The plan announced on Sunday will lower production of raw crude and bitumen from Alberta by 325,000 barrels a day, or 8.7 per cent, from January until excess oil in storage is drawn down. The reduction would then drop to 95,000 barrels a day until the end of next year at the latest. The discount of Western Canadian Select crude to U.S. benchmark West Texas Intermediate oil narrowed to US$23.23 a barrel as of 4 p.m. New York time Monday. WTI itself climbed to US$53.18 a barrel. Shares of oil producers operating in Alberta also surged, while there were declines for refining companies who had benefited from supplies of cheap crude. Alberta Premier Rachel Notley is following the advice of producers like Cenovus Energy Inc. and Canadian Natural Resources Ltd., which have been hammered by record low prices for heavy Canadian crude, which at one point were US$50 a barrel less than U.S. grades. The crisis has caused some producers to reduce production on their own, slash dividends and delay next year’s drilling plans. The curtailment plan, which will apply to both oil-sands and conventional producers, should narrow the discount between Western Canada Select and U.S. benchmark oil by at least US$4 a barrel and add an estimated $1.1 billion in government revenue in the fiscal year starting April 2019, according to the statement. Calgary-based Cenovus (CVE.TO) climbed 11.91 per cent - or $1.17 - to close at $10.99 in Toronto and Canadian Natural Resources (CNQ.TO) gained 9.55 per cent, while Devon Energy Corp., a U.S. oil company with a presence in Alberta, rose as much as 8 per cent in New York. Among refiners, HollyFrontier Corp. dropped as much as 6.3 per cent in New York and Imperial Oil Ltd. declined 3.74 per cent in Toronto. A chorus of companies, investors and industry leaders has rallied to the idea in recent weeks, saying that no other measure could help work down the glut of oil backed up in storage as quickly. Even Notley’s main political rival -- United Conservative Party Leader Jason Kenney -- has called for a curtailment. Alex Pourbaix, president and CEO of Cenovus Inc., said Notley's measures will help balance the market in the short term. "While curtailments have been used before by previous governments, we believe they should only be used for a short period of time, and only in extreme cases. This is an extreme case," Pourbaix said in a statement following Notley's announcement Sunday. "It makes no sense for Alberta to stand by while its valuable oil resources sell for next to nothing, the provincial Treasury loses up to $100 million a day, job losses continue to mount and our industry suffers billions of dollars in long-term value destruction." “Suncor believes the market is the most effective means to balance supply and demand and normalize differentials," it said. BNN Bloomberg Commentator Andrew McCreath discusses Alberta Premier Rachel Notley ordering oil producers in the province to cut output by 8.7 per cent. He says that although international oil players will be hurt, the decision will help the domestic economy. Last week, she announced a plan to buy rail cars to help ship an additional 120,000 barrels of crude a day, increasing already-record levels of crude shipped by train by more than 30 per cent. That plan entails running two additional trains a day, each pulling 100 to 120 cars. The system would require a total of about 80 locomotives and more than 7,000 cars. However, it was Notley’s assurances that a decision on curtailing output was coming soon that helped boost heavy Canadian crude prices by 49 per cent last week. Even after that gain, Western Canada Select crude was trading for US$29 a barrel less than U.S. benchmarks. WCS closed at US$13.46 a barrel earlier this month, the lowest on record in Bloomberg data stretching back to 2008. The grade’s discount to U.S. benchmark oil prices widened to US$50 a barrel last month, also a record.